Ted Micka, the Barn Doctor, has been restoring and renovating barns and other structures since 1990. A love of craftsmanship runs in Ted’s family. His grandfather, a union carpenter in Boston, taught him the importance of quality workmanship. His years of experience working on and studying older structures gives him a unique insight into the building methods and materials of the past. And his passion for the work is evident in everything he does. A founding member of the Michigan Barn Preservation Network, Ted has worked on projects both large and small all over Michigan and the surrounding states. Ted combines his engineering expertise (he is a graduate of the U-M’s College of Engineering) with a boundless knowledge of and interest in barn restoration, making him one of the very best in the country. 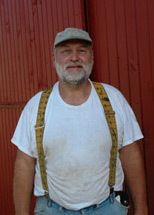 In addition to barn repair, Ted has experience in period reproduction and adaptive restoration. He maintains his own lumberyard and performs most of his own sawing, milling, and turning. He is also working on a book about the repair and restoration of older barns. Ted’s business is run from his 40-acre horse farm set among the rolling hills of rural Jackson County. He shares space with Micka's Work Farm, managed by his wife June. Ted’s idea of a leisure activity is to do renovation work on his 170-year-old farm house. But since he is usually too busy with his customers’ rehabbing projects, June isn’t expecting the house to be finished any time soon (completed 2013).